There are many articles and charts to "determine" if a pet is considered a "Senior" or a "Geriatric", but what do these names really mean to you - the pet owner? The above chart is one of many available and all of them differ slightly from each other. This chart may look really confusing, but we can analyze it. Lets look at a couple of easy examples. 1. Cats are somewhat easier than dogs, since most cats are similar in size and their life expectancy is somewhat more predictable. So, if your cat is older than 8, then the term Senior is reasonable. If your cat is older than 14, you could use the word Geriatric. 2. If you have a 20 lb dog, then that dog would be considered a Senior around 9 years old and a Geriatric around 12 years old. 3. If you have a 60 lb dog, then that dog would "age" faster. That dog would be considered a Senior around 6 years old and a Geriatric around 10 years old. 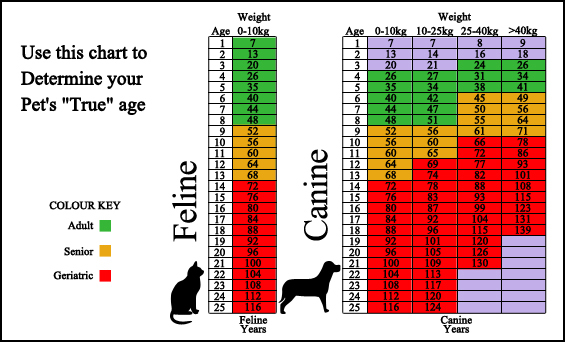 The numbers in the corresponding boxes represent your pet's approximate age in human years. So a 60 lb dog that is 16 years old would be more like a 99 year old person. OK, so what does any of this mean? The big problem is with our labels. In people, the word Senior can have several meanings: old enough to get Senior discounts at a restaurant, old enough to be getting letters from AARP, old enough to be a part of Medicare, or perhaps old enough to be retiring??? Does any of those choices mean that we are sick or suffering? The simple answer is "NO"! We all say that "age is not a disease". This is true, but older pets are more prone to developing certain problems. Some of these problems may go unnoticed or not affect your pet's well being, but they are brewing under the surface. It is at this point where a veterinarian might be able to diagnose these issues and address them before they adversely affect your pet's life. At our hospital, we encourage our senior pets to get good physical examinations twice a year instead of just once a year. In addition to the bi-annual examinations, we feel that doing some routine blood and urine tests will help us to determine if there are steps that we can take to improve your pet's life. In our opinion, Geriatric pets are those that actually have a chronic condition and require, or would benefit from, continuous medical support or treatments. We will talk more about the possible conditions that can affect our older patients in separate pages.